The best bond market commentary is written so its writing style doesn’t interfere with readers’ understanding of the content. Here’s a screen shot of some bond market commentary that I received via email in November. It could use some help. (By the way, I’m not out to embarrass anybody. Before I started critiquing this piece, I googled the text to make sure the author couldn’t be identified easily.) Let’s analyze and rewrite this piece. One good thing about this commentary is that it was published promptly after the end of the quarter. Most commentary takes days if not weeks to get published. The speedy production cycle probably meant the author didn’t have lots of time to process his or her ideas. Nor was there much time for editing or proofreading. It’s not easy to pump out clean commentary under these circumstances. Let’s look at the commentary’s weaknesses. It lumps together a bunch of sentences that don’t stick to a single theme. It jumps around chronologically, going from September to August to October to second quarter to June to September to October. 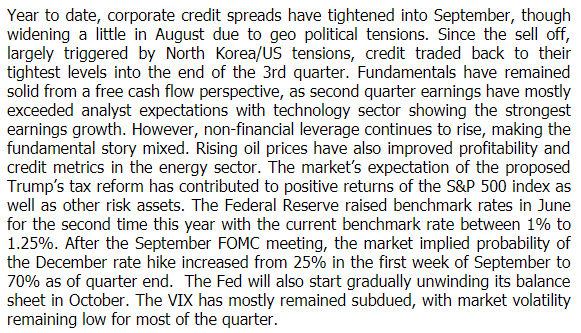 The subject-matter progression is a little better organized, going from credit to risk assets to the Fed to the VIX. However, these subjects shouldn’t all be in one paragraph because the author doesn’t write about them in relation to each other. The paragraph lacks a topic sentence that says why all of these items are grouped together. The paragraph is dense and intimidating. It’s confusing that the paragraph writes about October as if it’s in the future, saying “The Fed will also start gradually unwinding its balance sheet in October.” Did the person mean to write “November”? It’s strange to start the Fed section with old news from June. it’s better to start the section in the present, as you’ll see in the rewrite below. The paragraph has grammatical errors. Credit doesn’t trade to “their tightest levels.” It should be “its tightest levels.” “The proposed Trump’s tax reform” should be “Trump’s proposed tax reform.” It’s a little light on commas for my taste. The paragraph has a spelling error. “Geopolitical” is one word. Note: I give a pass to this commentary for using technical language, such as “credit,” “risk assets,” and “FOMC” because this commentary is aimed at practitioners. It’s fine to write in the language of your audience. In fact, it’s appropriate, as long as you don’t expect regular folks to understand you. The main change I’d make to this piece is to reformat it. I think this piece was intended to provide some quick information without building a bigger argument, so I’m not writing an introduction or strong topic sentences. I am, however, adding bullet points and headings. I don’t follow the bond market closely so I may make some factual errors in my rewrite. I raise some questions about the content in red text. Corporate credit spreads: Corporate credit spreads tightened into September, after widening a little in August due to geopolitical tensions. Since the September sell-off, largely triggered by North Korea/US tensions, credit traded back to its tightest levels [tightest since when?] into the end of the third quarter. Bond market fundamentals: Fundamentals have remained solid from a free-cash-flow perspective, as second-quarter earnings mostly exceeded analyst expectations with technology sector showing the strongest earnings growth. Rising oil prices improved profitability and credit metrics in the energy sector. However, non-financial leverage continued to rise, which is a negative. Risk assets: The market’s expectations for Trump’s tax reform proposal contributed to positive returns for the S&P 500 index and other risk assets. Fed policy: The fed funds rate is currently between 1% to 1.25%, following the Fed’s raising rates in June for the second time this year. The market-implied probability of a December rate hike increased from 25% in the first week of September to 70% as of the quarter’s end. The Fed is expected to start gradually unwinding its balance sheet in [what month or time period?]. VIX: The VIX has mostly remained subdued, with market volatility remaining low for most of the quarter. It’s good to relate performance to your market commentary no matter where you place your clients’ performance. Below are the results of a poll I conducted. Placing performance at the beginning of the letter was by far the most popular choice. Need hands-on help with your commentary? I can write your commentary based on interviews with your investment professionals or based on attribution analysis and other materials provided by you. I also edit commentary you’ve written to make it more compelling and reader-friendly. If your budget is limited, hire me to evaluate your newsletter and suggest improvements that you can implement yourself. Note: On January 28, 2014, I deleted the poll and replaced it with a screenshot of the poll results. 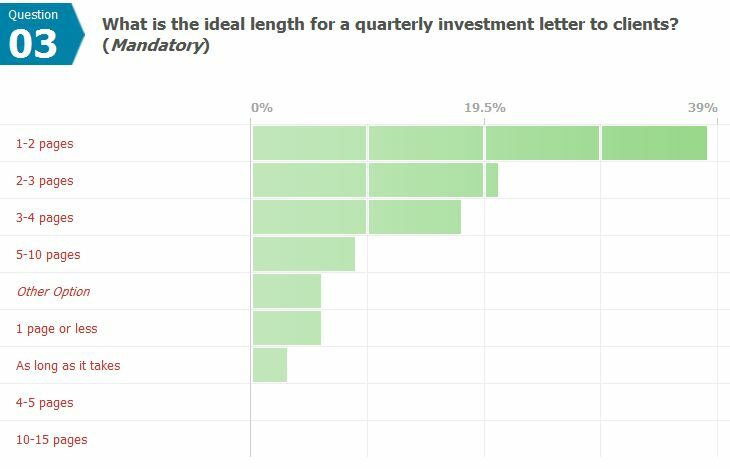 https://www.investmentwriting.com/newsite/wp-content/uploads/2013/12/performance-placement-poll-results-012814.jpg 523 1128 Susan Weiner, CFA https://www.investmentwriting.com/newsite/wp-content/uploads/2016/12/investmentwriting_logo_2016.png Susan Weiner, CFA2013-12-17 05:00:102015-08-27 11:46:17Quarterly client letter poll: Where do you put performance?